Using the new concept a user did not have to reboot all the time, switching from one OS to the other. They were running in parallel. When smart phones came along the same idea was born: What if you wanted to run Android on your HTC HD2 even though it shipped with Windows Mobile 6.5? Well, the XDA Developers did an excellent job on this by making this possible for hand held devices. ROMs were ‘cooked’, OS were tweaked and so on, in order to reach a point where a user could choose the OS to load. VMWare and LG presented a virtualized Android phone in MWC 2011 and the potentials of this are very impressive. VMWare has started with Android and LG but i am pretty sure that there is a lot to come on this field. Check out the video from Engadget along with some comments here. After a brief break to catch our breath and have a much-needed holiday, Synthetic Toys is back up and running. This time we attempt a recap of 2010 in the area of Augmented Reality (AR). AR has drawn much attention through the past year, almost a decade after we started working on the subject. Although the ‘hype’ surrounding the field is quite a lot we are still skeptical about recent ‘advancements’ and how these will shape the way AR evolves. We will attempt to look into things aided from notable sources and offer our predictions and hopes for the field in 2011. One thing is for sure. AR is as interesting as it ever was, if not more, now that people begin understand its idiosyncrasies and pitfalls as well as its potential. Handheld AR is probably the sector that became more popular during 2010 with many companies offering AR-related applications, attracting lots of public attention [3,6]. Companies like Layar, Wikitude, Metaio and Qualcomm presented applications within this paradigm. The general idea is to use a smartphones modalities – GPS, compass, camera and wireless/GSM – in combination to superimpose 2D and 3D information in space using primarily the phones screen as a presentation medium. Examples of each company’s approach can be seen on their websites. In our minds we separate Handheld AR applications in two categories. Those that use a tangible reference for registration – like Qualcomm’s game using a camera tracked marker – and those that use a non-tangible one, like GPS and compass. Marker-less registration kind of falls between these categories but can be potentially more important. 3D Displays – HMD-less or not – have also gained lots off attention the last year, due to the appearance of blockbuster titles like Avatar in 3D. Big players like Sony, Panasonic, Toshiba, Mitsubishi and Philips introduced such displays in the market, in an effort to capitilize on the technology. Generally, HMD ones are not as easy to use due to various issues such as ocular and non-ocular symptoms, as commented on a previous post and require further research . 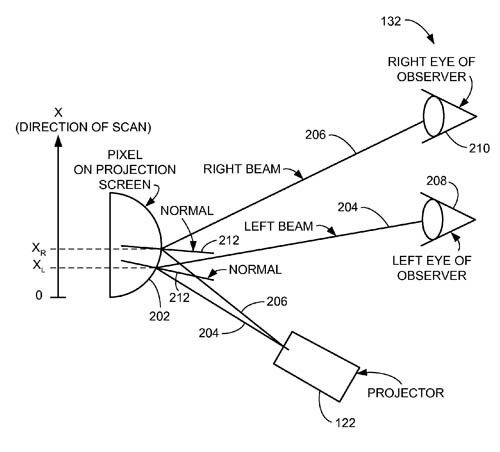 For this reason many researchers, including companies like Apple and Microsoft experiment with 3D displays that do not require a spectacles-type apparatus, but instead rely on different modalities to determine orientation of gaze . Although the currently available solutions are at their infancy we feel this paradigm is quite promising and there is lots of potential and opportunities for research. Particularly, in conjunction with smartphones, where viewing distance is more or less easily determined, such displays can enhance handheld AR to another level, without requiring from the users to wear ‘dorky’ HMDs. One of the subjects often discussed in workshops and conferences is the need for stadardisation in AR. Many of the aforementioned AR players, researchers and institutions have debated on whether it is time for AR to have such standards. Granted standardisation does offer some benefits through unification, interoperability, reliability and predictability. We feel that AR standardisation deserves a thorough examination and we will look into the subject in detail in the future. We are also keen on seeing the results of an AR Standards Meeting in Barcelona on February, expected to attract the interest of many important players in the field. However, we feel its a tad too early, mainly because we are reluctant to believe that AR has matured enough and that the current ‘call’ for standards is more market-driven than a technological necessity. Handheld AR is probably the flavour of AR that will remain fairly popular due to the evolution in smartphones and tablets. However, there will soon be dire need for new types of services that enhance the user’s day-to-day routines and reality. Enhancing the latter does not necessarily mean placing high quality 3D graphics around. Enhancement also can come as any type of information, whether visual, audible or as tactile feedback. Mechanics allowing tethering and location awareness are of course of paramount importance. However, increasing accuracy and performance while maintaining multi-modality will allow more complex – not complicated – frameworks to develop new services. We also feel that interaction between users, within the AR space much like a shared environment can have an important role is the sense of immersion of users. Leaving the domain of Handheld AR behind and speaking in more generic terms, Interfaces in the context of AR are always a very challenging subject. Although some progress has been made on non-HMDs, very little improvement has been observed in HMDs – and to that we have to agree with Tom Carpenter . Bearing in mind our own experience with HMDs and the sense of immersion they bring to the table there is still a lot to be done to investigate different technologies as well as the side effects of HMD usage. Naturally, we await with great interest the developments on the glass-less front. If one thing has advanced considerably and will continue to do so, pushing AR development further, is processing power, particularly in small form factor platforms. Smartphones are capable these days to render complex graphics with very good frame rates. Consumption and battery longevity is indeed an issue but not so much as in the past. Although technically it belongs to 2009, Epic’s demonstration of the Unreal Engine 3 on IPhone, shown bellow, aptly demonstrates what these handheld beasts can do. Concluding, we have to admit our review is nowhere near as extensive and detailed it could be. We gathered the things that had made an impression to us, those that we feel are the more important ones. We are certain we missed something and that our assessment may be erring a bit on skepticism. We are, nonetheless. very excited about the publicity AR is receiving and we are also planning on ‘playing ball’ within the current market with some ‘gimmicks’ of our own. Android 3.0 Honeycomb has Google-Built in Augmented Reality? Augmented Reality: Pure Hype or the Next Big Thing in mobile? Is 3D bad for you?